… is, of course, the title of the Man Booker prize-winning second book in Hilary Mantel’s historical series about Thomas Cromwell. She won the same prize for Wolf Hall, the first in the series, as well as a stash of other prizes, evidence, if evidence were needed, that historical novels are the books de jour. Ms Mantel will be giving this year’s BBC Reith Lectures entitled Resurrection: The Art and Craft this Spring. I look forward to listening to her, but I’ve already been reading what she has said, as well as other writers thoughts, on writing the past. 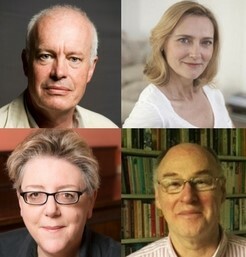 This is in preparation for The Past is Another Country, the panel discussion about writing historical fiction at the Clapham Book Festival on 6th May. My fellow panellists are prize and plaudit laden. 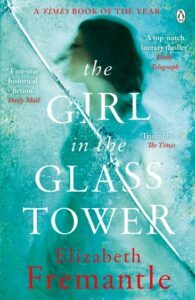 First is Elizabeth Fremantle, whose latest book The Girl in the Glass Tower was a Times Book of the Year 2016. She has set four novels in and around the Tudor court, particularly exploring the lives and experiences of women and their relationship with power and obedience (or otherwise) which often resonate with female experience today. The Girl in question is Arbella Stuart, and it is her story, of a woman raised and groomed to be the presumed heir to Elizabeth I but whose life is lived in virtual incarceration to protect her from plots to oust the Queen and place her on the throne instead. Arbella Stuart was an intelligent and complex woman whose repeated attempts to liberate herself, sometimes highly dangerous, mark her as a fascinating victim of a system into which she did not fit. Arbella was unknown to me before I read The Girl and the novel, aside from being an astute psychological study shines an interesting light on the well-trodden ground of Elizabethan politics. Her next novel, to be published in 2018, is The Poison Bed, a psychological thriller set around the events of 1613 in which a man is mysteriously poisoned in the Tower of London. Already no stranger to scandal, the Countess of Somerset, wife of the king’s favourite, confesses; but as the investigation unfolds it seems the case is much more complicated, going right to the heart of the Jacobean court and even as far as the King himself. Robin Blake places his fiction in the Georgian period, his successful Cragg and Fidelis series (published by Constable) is set in 18th century pre-industrial revolution Preston. His north country Coroner and local doctor encounter death, crimes and mysteries in a society on the cusp of great changes. 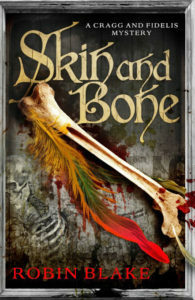 Also a noted biographer, of painters George Stubbs and Anthony Van Dyck, Robin’s fourth book in this series is Skin and Bone. This is an intriguing story of infanticide in a tannery, which reverberates around the town and provides an opportunity for the good burghers to rid themselves of the despised tanners, obstacle to modernisation. Needless to say, Cragg will not be browbeaten, but finds himself in trouble when rescues a lady from a fire. I was gripped by this mystery and fascinated by the portrayal of a society with one foot in the future, but looking to the past. Robin is currently working on the next book in the series. BAFTA-winning Simon Berthon is the third panellist. 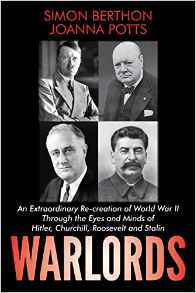 He may already be known to readers as a television journalist, director and producer, or through his books on WWII, most recently, Warlords a study of Churchill, Roosevelt, Hitler and Stalin which was turned into a TV documentary for Channel 4. Simon’s next book is, in part, a political thriller, a novel, set in 1990s Ireland and modern London entitled Woman of State which is due for publication by Harper Collins in July. Simon is currently working on his next novel. This entry was posted in Books, Culture Vulture, London and tagged Books, London, Worth a visit by juliej. Bookmark the permalink.